2012 was a great year for anyone who loves the music of the Blue Nile. Not only have we enjoyed deluxe reissues of the Blue Nile’s first two albums, 1984s A Walk Across the Rooftops and 1989s Hats, but Paul Buchanan released his long awaited debut album Mid Air in May 2012. Then five months later, in October 2012 a deluxe edition Mid Air was released. This deluxe edition of Mid Air is a double-album, with Disc One featuring Mid Air and Disc Two featuring bonus tracks. This includes instrumentals, remixes and live tracks. 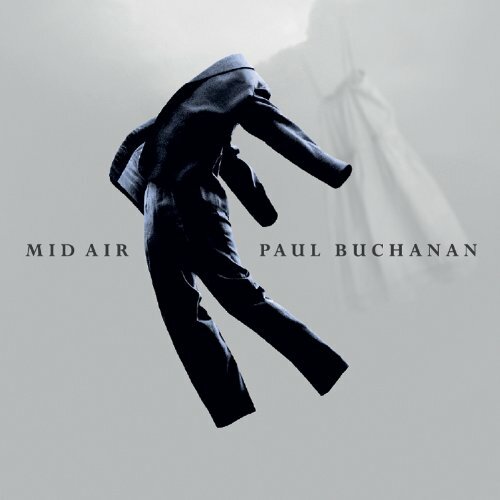 Before I tell you about the music on Mid Air and the disc of bonus tracks, I’ll tell you about Paul Buchanan’s musical career up to the release of Mid Air, which quite rightly, has been nominated for 2012s Scottish Album Of The Year Award. Blue Nile were formed back in 1981, when three former Glasgow University graduates decided to form a band. Although Robert Bell, PJ Moore and Paul Buchanan formed Blue Nile in 1981, it wasn’t until 1984 that they released their debut album A Walk Across the Rooftops, on Linn Records. While A Walk Across the Rooftops was well received, it wasn’t a huge commercial success. Since then, A Walk Across the Rooftops has been recognized as a minor classic. Having released their debut album in 1984, it would be five long years before the Blue Nile released their sophomore album Hats. After a long five-year wait, during which the Blue Nile’s reputation as an elusive, mysterious group grew and grew. During that time, the Blue Nile recorded an album, didn’t like it and then, like a ritual cleansing of their mistakes burnt the master tapes. Then in 1989, the Blue Nile’s sophomore album Hats was released. Hats was released to critical acclaim and commercial success. It was after the release of Hats, that the Blue Nile decided to embark on one of their rare tours. Given the Blue Nile are somewhat reluctant stars, who shied away from interviews, publicity it’s no surprise that live appearances were something of a rarity. I was fortunate to see the Blue Nile tour during that tour. That night, they played material from their first two albums, 1983s A Walk Across the Rooftops and 1989s critically acclaimed Hats. Lead singer Paul Buchanan said little between songs, and seemed almost awkward, embarrassed even, by the acclaim and applause the band were receiving after each song. Once the concert was over, people left looking forward to the next Blue Nile album. Little did they realize, it would be seven years after the release of Hats. Seven years later, in 1996, Peace At Last was released, featuring a very different sounding Blue Nile, driven by Paul Buchanan’ acoustic guitar and featuring a gospel choir. Critics were divided about the Blue Nile’s new directions. Indeed, Peace At Last is something of a misunderstood album. Fans, however, loved Peace At Last. To them it was well worth the seven year wait. They hoped the next album wouldn’t take seven years to make. It didn’t, it took eight years. The followup to Peace At Last, High, took even longer to make, eight years, but reached number ten in the UK album chart. Given the success of High critics and fans wondered whether at last, The Blue Nile had made their breakthrough. In typical Blue Nile fashion, no further albums were released by the band. Last year, the band’s thirtieth anniversary, rumors were rife about a new album, but nothing happened. Then earlier this year, Blue Nile lead singer Paul Buchanan announced he was releasing his debut solo album. If there was to be no further Blue Nile albums, then this was the next best thing. Mid Air was released on 21st May 2012 on Newsroom Records. However, how does Mid Air differ from The Blue Nile’s four albums? Eight years after the release of 2004s High, it’s not just a very different sound that greets the listener on Mid Air, but a much older and wiser Paul Buchanan. He’s now fifty-six, and from the music on Mid Air, has spent much of his time reflecting on life and everything it has thrown him. Whether love or loss or pain and death, it has affected Paul and the music on Mid Air. While the death of one of Paul’s closest friends has caused him pain and hurt, making him reflect on mortality, the breakup of The Blue Nile caused him pain and hurt. The Blue Nile were more than just a band, they were three close friends for over thirty years. So, the breakup of the band that Paul thought would last forever was another loss to Paul. This plus everything that’s happened to him in the past eight years has shaped the music on Mid Air. Mid Air features fourteen songs that Paul wrote in his flat in Glasgow’s west end. With just a piano in his kitchen for company, Paul spent the early hours of many a night writing the songs on the album. Rather than write the songs on his trusty guitar, he preferred the immediacy of the piano. He could just sit down whenever he wanted, working on an idea for a song. Eventually, Paul had fourteen songs written, the recording took place mostly in his Glasgow flat, but also at a studio in Glasgow. Recording of Mid Air took place over two years, with Cameron Malcolm, son of Calum Malcolm The Blue Nile’s former producer. Helping Paul complete the album was Robert Bell, The Blue Nile’s bassist. Eventually, after two years, Mid Air was released on 21st May 2012. How would the album fare compared to The Blue Nile’s four albums? On the release of Mid Air, the album reached number fourteen in the UK. This meant that Mid Air had almost matched the success of The Blue Nile’s most successful album High, which had reached number ten in the UK. In his native Scotland, Mid Air reached number one, while it reached number four in Ireland. It seems that fans loved the older, wiser and more pensive Paul Buchanan that features on Mid Air. However, why has Mid Air proved so popular? That’s what I’ll tell you after I’ve told you about some of the highlights of Mid Air. Opening Mid Air is the title-track Mid Air, the first of fourteen short tracks. It seems Paul has heeded Brian Eno’s maxim that a shorter song is a more effective one. It’s just two and a half minutes long, with Paul playing the piano that accompanies him. Straight away, when that familiar voice washes over you, it’s apparent that Paul’s emotive vocal has the same quality that we last heard on High. Neither has he lost any of his talent as a songwriter. Instead, he’s matured as songwriter, with his lyrics pensive, thoughtful and melancholy. His vocal is tinged with sadness and regret at the memories he recalls. Later, wistful strings sweep in, adding to the emotion and sadness of the track. The sparse, pared down arrangement works beautifully, complimenting Paul’s vocal and leaving you wanting more, much more of Mid Air. For anyone whose spent anytime as a night-owl, sitting, thinking and wondering, then Half The World could’ve been written for them. Opening with the lyrics “half the word has gone to street, half the world is on its knees,” to me, the lyrics paint a picture as Paul sitting in his Glasgow flat, observing the city as it sleeps. He thinks, thinks about the wider world, turning ideas over in his head and in doing so, his stream of consciousness becomes a song, a very good song. In fact, it’s one of the highlights of Mid Air. Just Paul playing the piano and singing some contemplative, intelligent lyrics, before briefly, subtle, melancholy strings make a fleeting appearance. That’s all it takes to make this haunting, heartfelt song one of the highlights of Mid Air. Newsroom is another late-night song, full of heartbreak, loneliness and hurt. Paul sets the scene with the lyrics “last out the newsroom turn out the lights,” before delivering a triumvirate of moving, hugely emotive lines. “There’s no-one left alive, there’s no-one to make love to, no-one to blame.” The contrasts between the banality of turning out the lights, and the sense of desolation, desperation and loneliness felt by the life of song’s central character is huge. Here, with just the piano accompanying Paul the tortured troubadour, he gets across the sense of bleakness that the reality that their life has become. With Paul’s almost emotionless delivery and the lo-fi arrangement, this works beautifully, but leaves you thankful it isn’t you Paul is singing about. When you hear I Remember You, there’s a real Blue Nile sound and influence, especially their debut album A Walk Across the Rooftops. It’s the use of synths and gentle horns that accompany Paul and his piano. He’s reflecting, in a contemplative mood, with the arrangement meandering into the spaces left by his vocal. His vocal is laden with emotion and memories. Later, when Paul briefly hesitates, and has to restart the line, this adds to the effectiveness and poignancy of this powerful track. Wedding Party is a track that demonstrates Paul Buchanan’s talent as a songwriter. Not only does he paint pictures that unfold before your eyes, but he sounds as if he’s lived the lyrics he sings. His Wedding Party is like a tragi-comedy, complete with “tears in the car park” as a former lover marries someone else. Much as she tries, she can’t let it go, the hurt and regret haunting her every waking hour. The addition of the haunting piano and almost broody, menacing strings add to the effectiveness and sadness of a track that many people will be able to relate to, with its sense of love lost, but not forgotten. Two Children is like a two minute short story set to music by Paul. He paints the picture of a couple with what seems a perfect life. They’ve “Two Children…flowers in every window…and…apples on every tree.” Their relationship is just a facade, with the couple really just two children, playing at grownups. Paul’s delivery has a tenderness, but is tinged with sadness that the reality of the situation can no longer be ignored. With just the piano and melancholy strings accompanying him, this reflects the sadness and pathos of situation perfectly ad subtly. Tuesday is a relationship, with Paul singing of the “early morning phone call,” and its plea for forgiveness and a return to “how things used to be.” You get the sense that he’s fallen for this before, but lived to regret it. Things you see, can never be same. There’s always the doubts and blame. Paul’s voice reflects this, with piano strings and standup bass providing a complimentary backdrop to this tale of love lost and heartbreak. Older and wiser, Paul knows that things are never the same again, time and experience prove this. Closing Mid Air is After Dark, the longest track on the album, just under four minutes long. Given how slowly The Blue Nile and Paul Buchanan produce albums, I find myself willing Paul to close Mid Air on a real high. True to form, Paul doesn’t disappoint. He’s kept one of the most melancholy and beautiful tracks until lost. It’s a paean to love, but not in the traditional sense. It’s a love song, but one he sings to Glasgow and its nocturnal side, After Dark. As someone who knows and loves Glasgow, I can only concur with Paul’s sentiments. Paul just playing piano as he gives one of his most impassioned, heartfelt vocals, opening up his heart and singing about the one thing and one place that’s been ever-present during his life, his hometown of Glasgow. Where the Deluxe Edition of Mid Air differs from the original release in May 2012, is the addition of a second disc of bonus tracks. These offer a revealing insight into Paul Buchanan and his music. There are ten tracks on Disc Two, with three tracks from Mid Air, After Dark, Tuesday and A Movie Magazine transformed into instrumentals. They’re captivating tracks, which show another side to Paul’s music. My True Country is also given a makeover, while Buy A Motor Car is remixed by Robert Bell, Paul’s old Blue Nile bandmate. There are four tracks on Disc Two that aren’t on Mid Air. The first is Have You Ever Been Lonely, a track that isn’t on Mid Air is one of the most, emotive, heartfelt tracks Paul has recorded. Two other new tracks are Lost, Duty and Lost, which are both welcome additions, providing an insight into Paul’s music. God Is Laughing closes Disc Two, and it’s as if Paul is laying bare his soul, seeking answers and meaning to life and its foibles. For me, this is the classic Paul Buchanan and the perfect way to close Disc Two of Mid Air. Having been captivated by the subtleties, nuances and charms of Mid Air, I can’t recommend this album highly enough. It’s a really mature, grown-up album from Paul Buchanan, which must be one of the favourites for 2o12s Scottish Album Of The Year Award. Mid Air is on the long-list, and I’m sure will be on the short-list. For Paul Buchanan, one of the grand old men of Scottish music, not only is Mid Air a deserving recipient of the Scottish Album Of The Year Award, but would be recognition of everything he’s done for Scottish music. He’s now fifty-six and his world-weary voice has matured with age, as is his talents as a songwriter. In many ways, Paul has become Scotland’s answer to Tom Waits and Leonard Cohen. Not only has age resulted wisdom, but has resulted in fourteen tales of life, love and loss. To put this into perspective, it took The Blue Nile eight years and two albums to produce fourteen tracks, whereas Mid Air took but two years from start to finish. Maybe before Paul turns sixty, we’ll have the followup to Mid Air. I sincerely hope that this is the case, because the Paul Buchanan that can he heard on Mid Air is compelling, emotive music. Paul explores a variety of subjects, including life, love and loss, with hurt, regret and sadness constant companions to hope and love. The music is moody, broody and sometimes hopeful, perfect for The Blue Nile’s now grownup audience, who like Paul are eight years older than they were when The Blue Nile released High in 2004. For many of The Blue Nile’s loyal fans, then Mid Air will strike a chord. They too will have experienced, travelled and witnessed the same roads as Paul Buchanan has. Not only that, but they too will concur with his outlook on love, life and loss and will enjoy the fourteen tracks on Mid Air knowing he’s travelled the same roads that they have. The addition of the second disc of bonus tracks offers further insight into Paul Buchanan and his music. While there have been similarly reluctant stars like Paul Buchanan, there’s rarely been one so complex, articulate and intelligent. Paul Buchanan is able to give voice to the feelings and lives of many people. He provides the voice to his legion of fans, who hope that there’s much more music like Mid Air still to come for Paul Buchanan. Now that The Blue Nile are sadly, no more, then Paul Buchanan carries the mantle they’ve left behind. Thankfully, Paul produced a similar style of music on Mid Air, introspective, poignant and wistful music that’s best enjoyed late at night, After Dark, When Half the World Is Asleep. Standout Tracks: Mid Air, Newsroom, Wedding Party and After Dark.